(1) I Googled climate change forums and this one was at the top of the heap. Now I know why, it's in constant use by two posters - Into the Night and Wake - using the platform as their very own intellectual sandpit, flinging words at each other like particles of sand, hoping some of it will stick. Unfortunately, every other forum I've looked at has similar characters. All trying to prove how incredibly brilliant they are. I live in Australia. The land of drought, flood and fire. We are currently experiencing record breaking extreme weather events with frightening regularity. It's summer here now in sunny Queensland and we've been living through 36 consecutive days of temperatures over 30 degrees (Celsius), yesterday it was 48 in the sun. A couple of weeks ago Tasmania burned from top to bottom. Most of the fires were started by dry lightning. In 2018 we were fundraising across the nation to help our farmers through one of the worst droughts in history. Some of these farmers are now dealing with a 1 in 500 year flooding event. Winter 2018 we had snow in areas that have never recorded snow before. The list goes on and on. Whether Climate Change is real or not, our fault or not, to my mind, doesn't really matter. The individual that is actively downsizing their ecological footprint is making the world a better place for future generations, regardless of what their belief system may be. Those that continue to live their lives consuming resources indefinitely are NOT making the world a better place for future generations. Personally, as I have no family to follow after me, I don't care about the continuation of the human race. However I'm sure you breeders would prefer your descendants live in an environment that is, at the very least, as beautiful as the one we live in today. What's the down side of acting as though Climate Change is a real and dangerous threat to our way of life? Nothing. What happens if the naysayers are wrong and we're not smart enough to fix the error of our ways in time? I hate to imagine. Seems fairly straight forward to me. There we go you two (Into the Night and Wake), have at it. I won't be back. I Googled climate change forums and this one was at the top of the heap. Now I know why, it's in constant use by two posters - Into the Night and Wake - using the platform as their very own intellectual sandpit, flinging words at each other like particles of sand, hoping some of it will stick. Unfortunately, every other forum I've looked at has similar characters. All trying to prove how incredibly brilliant they are. I do find it strange that you didn't dig deeper and discover what was at the bottom of our arguments. I have all of the science behind me and now Nightmare is reverting to religion since he hasn't any science to back his ignorance. Now in FACT we are both on the same side, but I am using real science whereas he is using humbuggery and actually makes the most anti-science statements on the face of the Earth. You could get better answers from a tribal medicine man in the wilds of Africa. I can only conclude that you were looking for a forum to rant on about the dangers of the great global meltdown and are facing a forum almost entirely against you and with the science and evidence to back it up. The people who come to these forums to tell us about how we should all fear Man-Made Climate Change are those people who have gotten all of their information from an article in Ladies Home Journal and are adamantly going to protect us with their vastly superior scientific knowledge. So indeed, you needn't return because you'd be shot down in one second. Just can't escape science and mathematics, can you? I live in Australia. The land of drought, flood and fire. We are currently experiencing record breaking extreme weather events with frightening regularity. More 'extreme weather events'. Yawn. It's summer here now in sunny Queensland and we've been living through 36 consecutive days of temperatures over 30 degrees (Celsius), yesterday it was 48 in the sun. Yup. It gets hot in Australia during the summer. I remember it getting to 48 in Idaho from time to time when I was growing up. Meh. A couple of weeks ago Tasmania burned from top to bottom. No, it's still there. It still has vegetation on it. Most of the fires were started by dry lightning. In 2018 we were fundraising across the nation to help our farmers through one of the worst droughts in history. That practice is as old as farming. Some of these farmers are now dealing with a 1 in 500 year flooding event. That is as old as farming, too. Winter 2018 we had snow in areas that have never recorded snow before. Snow has been found in every part of Australia before 2018. The Doom and Gloom goes on and on. Whether Climate Change is real or not, our fault or not, to my mind, doesn't really matter. The individual that is actively downsizing their ecological footprint is making the world a better place for future generations, regardless of what their belief system may be. So you favor the Church of Green instead of the Church of Global Warming? Yet you present scripture from the Church of Global Warming? This shows how the Church of Global stems out of the Church of Green. Those that continue to live their lives consuming resources indefinitely are NOT making the world a better place for future generations. Resources are not finite, dude. Water is recycled by nature. Air is recycled by nature. Even oil and natural gas are recycled by nature. Personally, as I have no family to follow after me, I don't care about the continuation of the human race. However I'm sure you breeders would prefer your descendants live in an environment that is, at the very least, as beautiful as the one we live in today. It will remain so, just as it has throughout the many decades the Church of Green has been prevalent. What's the down side of acting as though Climate Change is a real and dangerous threat to our way of life? Nothing. What happens if the naysayers are wrong and we're not smart enough to fix the error of our ways in time? I hate to imagine. Seems fairly straight forward to me. Drop in, shoot, and run, eh? I do find it strange that you didn't dig deeper and discover what was at the bottom of our arguments. It's pretty simple. Your denial of the 1st and 2nd laws of thermodynamics and the Stefan-Boltzmann law, and your hatred and even threatening nature. None. You deny it, Wake. and now Nightmare is reverting to religion since he hasn't any science to back his ignorance. Religion and science have nothing to do with each other, Wake. No, we aren't, Wake. You deny the 1st and 2nd laws of thermodynamics and the Stefan-Boltzmann law. You think CO2 can warm the Earth. You think science proves religion to be false. You think it's possible to measure the temperature of the Earth. You think it's possible to measure the global sea level. You think it's possible to measure the global atmospheric CO2 content. You constantly try to change the Stefan-Boltzmann law to something else. You constantly make up lies about yourself, your relatives, and even the area in which you live. You're a bigot. You threaten people. You forget what is being discussed. You forget people that you've posted to. You deny both probability and statistical mathematics. You try to force negative proofs. You deny logic, especially set theory. You deny philosophy and what it does. No, Wake. We are NOT on the same side! True Scotsman fallacy. Science is a set of falsifiable theories. That's all. Science is not humbuggery. Neither are the 1st and 2nd laws of thermodynamics or the Stefan-Boltzmann law, which YOU deny. and actually makes the most anti-science statements on the face of the Earth. You could get better answers from a tribal medicine man in the wilds of Africa. Bigotry. These guys actually know their stuff pretty well. Better in some cases than 'modern' medicine, which often goes to these guys to find new drugs. These medicine men know the plants, soil, and wildlife in their area far more thoroughly than we do. The science is the same no matter what forum is visited. There is no evidence. It is not possible to measure the temperature of the Earth or the global CO2 content. I take it you don't like the Ladies Home Journal. Does your wife know? I live in Australia. The land of drought, flood and fire. I live in the USA. There are droughts, floods, and fires here too. We are currently experiencing record breaking extreme weather events with frightening regularity. It's summer here now in sunny Queensland and we've been living through 36 consecutive days of temperatures over 30 degrees (Celsius), yesterday it was 48 in the sun. A couple of weeks ago Tasmania burned from top to bottom. Most of the fires were started by dry lightning. In 2018 we were fundraising across the nation to help our farmers through one of the worst droughts in history. Some of these farmers are now dealing with a 1 in 500 year flooding event. Winter 2018 we had snow in areas that have never recorded snow before. The list goes on and on. Whether Climate Change is real or not, our fault or not, to my mind, doesn't really matter. The individual that is actively downsizing their ecological footprint is making the world a better place for future generations, regardless of what their belief system may be. Those that continue to live their lives consuming resources indefinitely are NOT making the world a better place for future generations. Personally, as I have no family to follow after me, I don't care about the continuation of the human race. However I'm sure you breeders would prefer your descendants live in an environment that is, at the very least, as beautiful as the one we live in today. It's not real. It is a circularly-defined buzzword, nothing more. What's the down side of acting as though Climate Change is a real and dangerous threat to our way of life? Nothing. Continuous worrying about absolutely nothing?? Driving yourself insane over absolutely nothing?? Giving power to people who want to control you?? What happens if the naysayers are wrong and we're not smart enough to fix the error of our ways in time? I hate to imagine. Seems fairly straight forward to me. They aren't wrong; they have science on their side. Climate change is nothing more than a religion based on a circularly-defined buzzword. I find it odd that you made an account for the sake of making one post... There are more people on this forum than just those two, but yes, they would likely be the two most active users. A few other users are relatively active as well, including myself. Inversion Fallacy. YOU make use of religion; ITN makes use of science. but I am using real science whereas he is using humbuggery and actually makes the most anti-science statements on the face of the Earth. Bulverism Fallacy. You don't know what that poster's motives are, nor are they relevant in any way. I think I could like living in Australia. What you don't understand is that Americans have a tendency to be introverted. I read on a European web page where one country said that Americans are good when there's a catastrophe but care little to minimize them. With climate change, a lot of it might be natural. Some information I saw suggested that the Pacific is warming where El Ninos form and the heat is flowing into the Indian Ocean. The hole over Antarctica can also cause wind patterns to change. This is something that would need to be considered. Also heat is being released from beneath the glaciers on Antarctica. It might be possible to limit the impact of climate change. I've been posting one link online where most of the heat associated with warming is in the oceans. Even if climate change is natural it won't matter to the people in here. They're paper tigers. That means that their teeth and claws are in their own imaginations. I used to post in here but have more productive pursuits. I thought you might find the link interesting. With me, I don't think the oceans became that efficient at absorbing excess heat in our atmosphere starting in 1998. Nothing in science changes like that without something obvious happening. I think that you would be wise to watch videos of Tony Heller. He is not a scientist. He is a reporter. That means that he has the ability to chase down and report the recorded facts and they are pretty ugly in regards to the so-called Global Warming. This is an unhealthy obsession of yours wake. I think most people have accepted that the Little Ice Age happened. Kind of hard to ignore what was written when newspapers and historians both claimed it was cold. 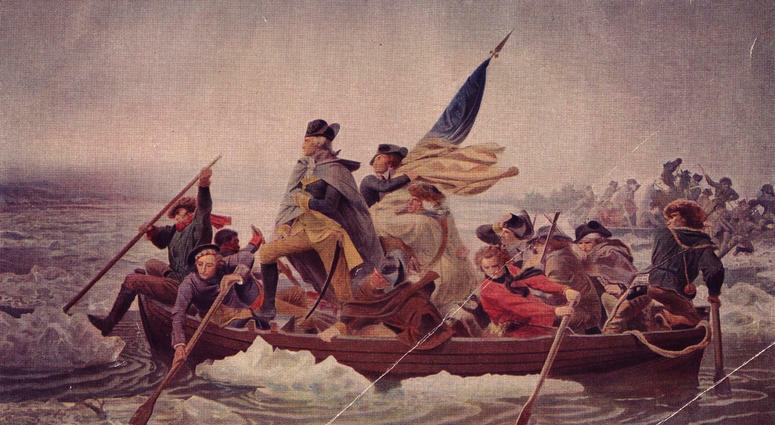 Is this picture of George Washington crossing the Delaware River accurate? Tell me James - what does that painting, which was meant as a expression of patriotism, have to do with this discussion? Do you think that Michael Angelo's statue of David was accurate? The temperature records shown by Heller cannot be criticized since they come from news stories of the time. That these same records are completely missing from the NASA charts is why the space division of NASA has asked them to totally eliminate the climate division. News stories are about local weather, Wake. They do not describe the temperature of the Earth. It is not possible to measure the temperature of the Earth. Have you seen a psychiatrist? They would most likely say that you and wake suffer from an obsessive compulsive disorder. You guys should get help. James___ wrote: ITN, Have you seen a psychiatrist? They would most likely say that you and wake suffer from an obsessive compulsive disorder. You guys should get help. James, you really ought to know what a psychiatric condition is before you start throwing that term around. Especially after thinking that picture of "Washington Crossing The Delaware" has some sort of relevance to our discussion. I do not display any of the symptoms of that disorder. Rather I am showing the orderliness of an engineer which profession I've followed for the better part of my life. That orderliness has allowed me to assist one scientist to achieve a Nobel Prize and another to win 3 Emmy awards, which was also why I was trusted enough to design and build the communications boards on the Space Station. Or would you prefer flying by feel as you do be more appropriate? That is a criticism and not an insult. If you are interested in the science of climate change there is certainly plenty of knowledge out there and it is easily obtained. But not if you go to sites that are so deeply biased without the slightest evidence that you cannot gain any knowledge but rather propaganda. I have passed along the fact that you can go to the YouTube or Bing videos from Tony Heller who is doing nothing more than reporting massive changes between the original records of temperature and the present renditions of exactly these same data and showing that they have been unscientifically modified for no other reason than to invent an entirely different climate. Let's recall the emails from Dr. Michael Mann's assistant to him saying - 'since the data and the predictions do not correspond we have to change the data." Dr. Roy Spencer who was the original manager of the NASA weather satellite program has shown the data from the founding of that program to the present day. He can see no change in the temperatures from 1978 and today. I have while he averages data on a 13 month rolling average I did so on a long term basis and like the charts of Tony Heller I show a cooling trend. Dr. Spencer has an interesting theory he puts forth on his site: That the warming and cooling cycles have very little to do with solar and Milankovitch cycles (though they may be triggers) but rather nothing more than the longer term formation of clouds which, depending upon type, either cool or warm the Earth. Be aware that this chart is backwards from what you might conjecture. That is, it is from present back in time. With it you can see a slow decline in temperatures until it reaches a natural limit - that limit I theorize, is when all of the humidity is frozen out of the air in an ice age. When this occurs all of the clouds disappear from the Earth. This in turns allows the full power of the Sun to be absorbed by the surface of the Earth with only the normal intermediate absorptions and reflections - so instead of some 600 watts/m^2 we get 1000 or thereabouts. This in turn causes a very rapid (in geological time) rapid recovery from the ice age to the end of an ice age. So while it requires some 100,000 years to drop into an ice age it only takes about 20,000 years to come out of it. This heating shows that this is the approximate time it takes to get the average humidity from zero or near there to the 4% that is the world average presently. Dr. Spencers conjectures are for short term climate changes whereas mine is for long term changes - ice age to ice age. Let us remember that the global warming hoax followed the ice age hoax. That people have been propagandized in the media with scare tactics to sell advertising. Why in the hell would a cover story in Ms Magazine in 2007 be about man-made global warming? Do you suppose young girls wanting to be starlets or models needed to know about the subject so that they could discuss the subject with their scientist boyfriends? (1043) @wake, Your post suggests that you are suffering from an obsessive compulsive disorder. I am quite surprised that you did not mention phallic or phallus. I am told that logic is based on phallus. If your phallic is significant then your phallus will be accepted by an inferior. Is this correct? Myself, am impressed by your phallic but do not find it desirable. Maybe your phallus(y) can be enhanced? @wake, Your post suggests that you are suffering from an obsessive compulsive disorder. I am quite surprised that you did not mention phallic or phallus. I am told that logic is based on phallus. If your phallic is significant then your phallus will be accepted by an inferior. Is this correct? You can only be interpreted in one manner - you have absolutely no knowledge in science and are maintaining what is known as "an appeal to authority". This is what is known as a follower hoping his leader knows what he is talking about. Or in your case - is absolutely certain. That makes the "I told you so" all that much sweeter. He is obviously making a psychoquackery remark. You take it seriously??? Rather I am showing the orderliness of an engineer which profession I've followed for the better part of my life. That orderliness has allowed me to assist one scientist to achieve a Nobel Prize and another to win 3 Emmy awards, which was also why I was trusted enough to design and build the communications boards on the Space Station. I don't believe you. You seem to know very little electronics. Or would you prefer flying by feel as you do be more appropriate? If you are interested in the science of climate change there is certainly plenty of knowledge out there and it is easily obtained. There is no science based on a meaningless buzzword. You first have to define 'climate change', Wake. I have passed along the fact that you can go to the YouTube or Bing videos from Tony Heller who is doing nothing more than reporting massive changes between the original records of temperature and the present renditions of exactly these same data and showing that they have been unscientifically modified for no other reason than to invent an entirely different climate. Let's recall the emails from Dr. Michael Mann's assistant to him saying - 'since the data and the predictions do not correspond we have to change the data." Arguing over whether random numbers have been changed into other random numbers is pointless. Dr. Roy Spencer who was the original manager of the NASA weather satellite program has shown the data from the founding of that program to the present day. He can see no change in the temperatures from 1978 and today. Satellites cannot measure temperature, Wake. They can only measure light. The emissivity of Earth is unknown. Not even Dr. Roy Spencer knows what it is. Weather satellites do not measure temperature. I have while he averages data on a 13 month rolling average I did so on a long term basis and like the charts of Tony Heller I show a cooling trend. Such a theory is about a past unobserved event, and therefore is not a theory of science. It is not falsifiable. Ice cores do not show the temperature of the Earth, Wake. Be aware that this chart is backwards from what you might conjecture. That is, it is from present back in time. With it you can see a slow decline in temperatures until it reaches a natural limit - that limit I theorize, is when all of the humidity is frozen out of the air in an ice age. Humidity doesn't freeze, Wake. Water does. The chart is a chart of random numbers. When this occurs all of the clouds disappear from the Earth. Did you know that clouds appear at both poles? Did you know that even during ice ages, there are still liquid oceans that evaporate water into the atmosphere and feed cloud formation? This in turns allows the full power of the Sun to be absorbed by the surface of the Earth with only the normal intermediate absorptions and reflections - so instead of some 600 watts/m^2 we get 1000 or thereabouts. The emissivity of Earth is unknown, Wake. No one knows much the Earth absorbs. This in turn causes a very rapid (in geological time) rapid recovery from the ice age to the end of an ice age. So while it requires some 100,000 years to drop into an ice age it only takes about 20,000 years to come out of it. This heating shows that this is the approximate time it takes to get the average humidity from zero or near there to the 4% that is the world average presently. It is not possible to measure the global humidity, Wake. That's exactly what it is...guessing. @wake, Your post suggests that you are suffering from an obsessive compulsive disorder. I am quite surprised that you did not mention phallic or phallus. You can only be interpreted in one manner - you have absolutely no knowledge in science and are maintaining what is known as "an appeal to authority". Wrong fallacy, Wake. It's an insult fallacy. One that resulted in a paradox. He is using no authority claims here at all. This is what is known as a follower hoping his leader knows what he is talking about. Or in your case - is absolutely certain. That makes the "I told you so" all that much sweeter. That the climate has changed is not challenged by any but the mad. That there are more extreme events is not shown by any real study. Austrailia has always had such weather. The down side of the fuss about CO2 is the use of food as fuel. 40% of US grain and a similar amount of EU food is diverted away from humans to this Biofuel crime against humanity. Almost half the world, 3.14 billion people http://www.globalissues.org/article/26/poverty-facts-and-stats , live on less than $2.50 a day. The use of biofuel has increased the price of basic food stuff by about doubling it. My guess is that if this policy stopped today 20 million people less would die in the next year. The year after would be even better as the effect of having most of your income going to food means that you have no money for economic development. The economy of the poor would boom massively if this artifical break on their wealth was stopped. The levels of emplyoment would shoot up as the new purchasing power allowed such luxuries as a bycycle or sending their kids to school. Maybe even some basic health care. The bad science of global warming hype is the greatest evil since the Mongol invasions. (3956) Tim - there is a serious problem with this weather crap. You aren't old enough to have seen a lot of perfectly normal weather variations. So you think that things are changing simply because climate variations can be as long as 20 years and in some cases such as the little ice age - 150 years. The satellite weather data shows NO changes since 1978 other than the normal chaotic weather changes that follow the "butterfly flapping his wings in Idaho causing a tornado in Omaha" sort of thing. This DOES follow the pattern trend showed in the Ice Core research. You have an extremely interesting analysis of the results of closing down the energy supply and the effects that would have. I will be sure to keep that in mind the next time the global warming crap hits the air. Go to YouTube and watch some of Tony Heller's videos. He is nothing but a reporter. He has no irons in the science fire and so only seeks to report on the falsehoods being sold to the American or for that matter the Earth's populations. [color=navy]That the climate has changed is not challenged by any but the mad. Define 'climate change', Tim. It is a meaningless buzzword. True, it has. Data in U.S. records don't show any increase in the number or frequency of hurricanes, either. Use of ethanol does not reduce CO2 at all. That was not its purpose in producing it. It's purpose was to remove tetra-ethyl lead from fuel as the fuel's moderator. Tim - there is a serious problem with this weather crap. You aren't old enough to have seen a lot of perfectly normal weather variations. So you think that things are changing simply because climate variations can be as long as 20 years and in some cases such as the little ice age - 150 years. Actually, he was saying quite the opposite, Wake. Pay attention. What's more the misreporting of the climate once looked into more deeply is staggering to say the very least. There is no reporting of the climate, other than the random numbers produced by the IPCC, NOAA, and NASA. Ice cores doe not indicate the temperature of the Earth either, Wake. He's not talking about that, Wake. Pay attention.